INDIANAPOLIS, Ind. (September 29, 2017) – The opening day of the 2017 SCCA® National Championship Runoffs® at Indianapolis Motor Speedway was pretty good for Andrew Aquilante. To start the day, he became the first-ever winner of a Runoffs event at Indianapolis with a dominant performance in the Touring 1 class. Then to close out the day, he mirrored his morning performance with an impressive victory in the GT-2 class, making that eight Runoffs wins for the driver from Chester Springs, Pennsylvania. By the end of the first lap, Aquilante already had a four-second lead. He stormed on, unchallenged, for a 33-second GT-2 win in his No. 33 Phoenix/Hoosier/Hawk/Varsity Chevrolet Corvette. Behind Aquilante, Harvey and Calvert where duking it out. Using every inch of the track, even the curbs, Calvert was trying everything to get by Harvey. On the second lap, Calvert got by and set off to try and catch Aquilante. However, he knew that was a tall order. So, he was happy with a runner-up position. While Aquilante and Calvert where clicking off laps, a fantastic fight was raging for the third and final spot on the podium. Harvey faded and in his place came Jonathan Start in the No. 51 Kalin Const/Hoosier/Encore/G-Loc Dodge Viper ACR-X, Tom Patton in the No. 50 Hoosier Race Tires/RedLineOil Sunbeam Tiger, and the No. 44 Engineered Components Company Dodge Viper of Adam Andretti. Those three waged war for several laps until Andretti finally found his way clear. With time running out, Andretti caught a glimpse of Calvert’s car down the track. Calvert had dialed back his driving to conserve equipment, and traffic was starting to impact lap times. Seeing a chance to improve his position on the podium, Andretti took a stab at Calvert. Patton finished in the fourth position, and Smart rounded out the top-five finishers. The Sunoco Hard Charger award went to No. 40 Richard Ruckh who started 33rd and finished 25th in his Amsoil Chevrolet Camaro. INDIANAPOLIS, Ind. — Provisional results for Friday’s GT-2 race at the 54th SCCA National Championship Runoffs from Indianapolis Motor Speedway, with finish position, starting position in parentheses, driver, hometown, car and laps complete. Article Courtesy of SCCA.com. Click here for the full article and race recap. INDIANAPOLIS, Ind. (September 29, 2017) – Andrew Aquilante became the first driver ever to win an SCCA National Championship Runoffs race at Indianapolis Motor Speedway Friday morning. For Aquilante, this is his seventh Runoffs victory. But taking the win at Indianapolis in Touring 1 (T1) is something special. Aquilante, from Chester Springs, Pennsylvania, led the 21-car T1 field to the green flag after a dominant performance all week in qualifying. But in Turn 1, Ross Murray drove around Aquilante on the outside in his No. 84 Complete Perf Motorsports/Hoosier Dodge Viper ACR-X to take the lead. Aquilante established himself in the lead from that point and simply never looked back. By race’s end, Aquilante had a 17-second advantage on Murray in second place. Mark Boden, in the No. 47 Fall-Line Motorsports BMW, finished third about 28 seconds back. But while Aquilante had a comfortable lead, he wasn’t necessarily comfortable up front as a racer’s mind can start to play games. Article courtesy of SCCA.com. Click here to read to full article and recap. Andrew Aquilante, in a grandfathered-in Ford Mustang Boss 302R, spoiled the debut of the brand-new Chevrolet Camaro GT4.R in Friday’s Pirelli World Challenge GTS race, the season opener for the World Challenge series, and the opening race for the Grand Prix of St. Petersburg weekend. Lawson Aschenbach had qualified the Camaro on the pole for Blackdog Speed Shop, but the tough Mustang from Phoenix Performance, the Aquilante family team, took the lead early in the race and never gave it up, as the race went caution-free. Jade Buford, in the Racer’s Edge Sin R1 GT4, took third place, after a strong fourth-place qualifying session. Finishing fourth was the Flying Lizard Porsche Cayman GT4, followed by the KTM X-Bow GT4 of Martin Barkey. The PWC GTS class is one of the most eclectic groups of cars you’ll find on the course at the same time. The Sin R1 GT4, for instance, is a racer designed in Bulgaria but built in the U.K., powered by a Chevrolet 6.2-liter LS3 V-8. The KTM X-Bow (pronounce it “crossbow”) is a track-day car the motorcycle maker introduced in 2007, and began building a year later. The Ginetta G55 is a British race car that has been around since 2011. The PWC has managed to adjust all these oddballs to race against more pedestrian vehicles, such as the comparatively familiar McLaren 570S GT4. 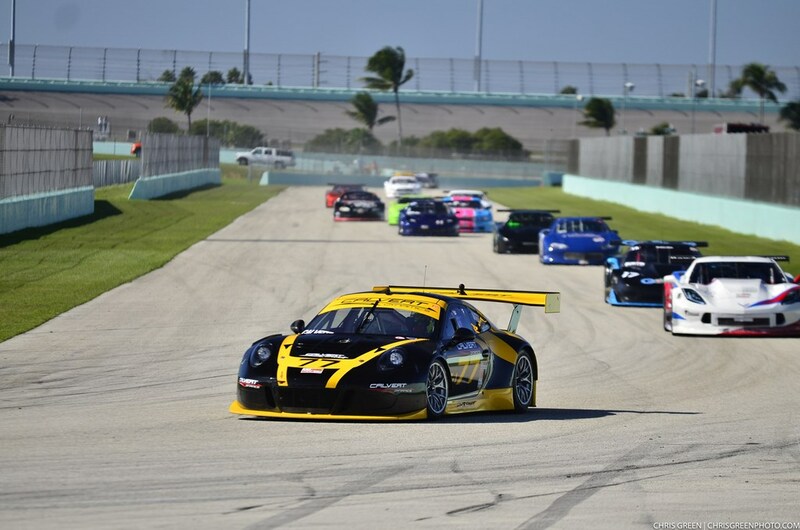 ST. PETERSBURG, Fla. – Andrew Aquilante’s double wins at the Pirelli World Challenge Grand Prix of St. Petersburg Presented by Case-It enjoyed a local flair after another dominating performance in the GTS division’s 50-minute sprint race with the No. 32 Phoenix Performance Ford Mustang Boss 302 at the 1.8-mile, 14-turn temporary street circuit near the St. Pete harborside. All Pirelli World Challenge results are provisional until the stewards review and technical inspection are completed. Aquilante of Chester Springs, Penn., recruited a team of three local St. Pete area residents to assist himself and his father, Joe, in the paddock this weekend for the two GTS events and the combination proved to be a winner after Andrew took the lead on lap three of the 34-lap feature and posted a 1.598-second win over Lawson Aschenbach of Palm Beach Gardens, Fla., in the No. 10 Blackdog Speed Shop Chevrolet Camaro GT4.R and 16-year-old Parker Chase of New Braunsfels, Tex., in the No. 19 Performance Motorsports Group Ginetta G55. Aquilante, who finished second to Michael Cooper in the 2015 GTS point championship, showed that the reliable Ford Mustang Boss 302 was the “horse for course” machine after a second consecutive double GTS win for the “Blue Oval” at St. Petersburg. Last year, Jack Roush Jr., captured both GTS main events in the Ford Mustang Boss 302. On Saturday, Aquilante started from the pole but lost the top spot in turn one to Aschenbach, who was debuting the new Chevy Camaro GT4.R in PWC action. On lap three, Andrew slid his older model Ford past the two-time GTS champion for the lead and Aquilante managed to hold off the pressure from Aschenbach to take another checkered flag in the 80-plus degree weather. Phoenix Performance is a performance tuner, providing maintenance, tuning and diagnostic services for foreign and domestic cars and trucks, as well as performance upgrades and tuning for street and track cars. The PWC race team occupies part of the 32,000 square-foot race shop, which is located 30 miles west of downtown Philadelphia. 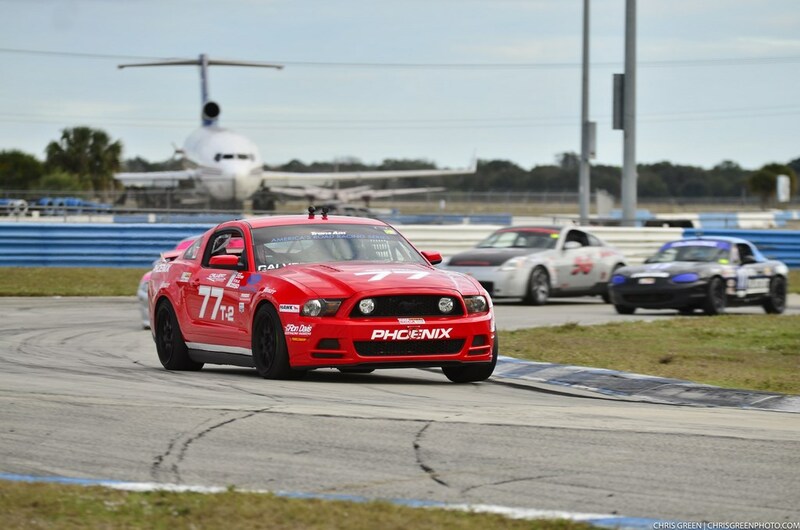 Since 1999, Phoenix Performance has prepared over 35 SCCA Runoff winning national championship cars for customers. Read the full press release from CalvertDynamics. Phoenixville, PA – Calvert Dynamics will make its SprintX debut in the Pirelli World Challenge this weekend at Utah Motorsports Campus. Preston Calvert and Andrew Davis will share the driving duties in a Phoenix Performance prepared Porsche 911 GT3R, while Calvert will also mark his second weekend in GTA competition and Michael Lewis will run the No. 98 in the GT class. SprintX will throw a new curveball to the team for their debut in the class, which features 60-minute long races featuring a driver change. Each entry has a pro/am driver lineup, with a pit stop required to change drivers and up to one tire between the 25- and 35-minute mark of the race, leading to plenty of strategy among pit lane. Calvert added: “The format of the SprintX races over a weekend will give me a chance to be both the starting and finishing driver in the car, which will be valuable experience. My main previous experience driving in an endurance format was competing for Phoenix American Motorsports in IMSA Continental GS class in 2014 with Kurt Rezzetano, where I learned the basics of this racing style. For strategy, decision-making will come down to team bosses Andrew and Joe Aquilante, along with Stefan Pfeiffer, race engineer. Teams will get two opportunities to show off their strategy skill set, with SprintX races scheduled for both Saturday and Sunday. “”The timing of pit stops is guided by a simple algorithm within the mandated 10 minute stop window. Our crew prides itself on quick and precise over-the-wall performance, so we are all excited by the opportunity to practice these skills again,” said Calvert. Calvert will be busy, also racing in both GT/GTA/GT Cup rounds in Utah, where he hopes to build on his fourth place effort at Mid-Ohio two weeks ago in the No. 77 Porsche. Michael Lewis closed out the Mid-Ohio weekend with a run to a sixth place result in the No. 98 Porsche, and hopes to move onto podium results heading into a double-header for the GT classes in Utah.